Comics on the Brain has written a lot about Blue Beetle. So much that he actually appears in our tag cloud. In particular, we’ve suggested a good way to write a Ted Kord comic. 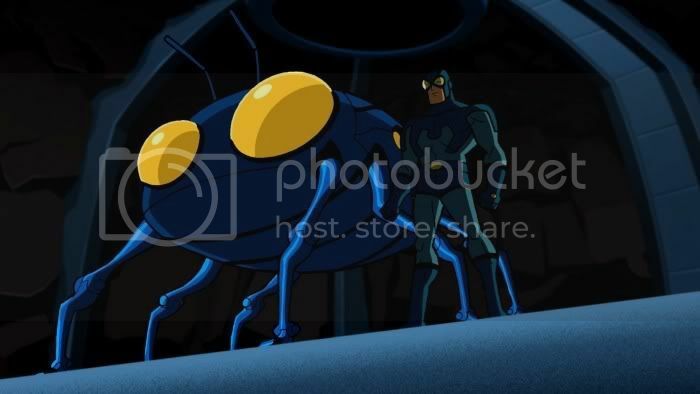 It seems however, that there’s a lot of love for Blue Beetle out there. Over in the YouTube universe, there are two neat efforts to offer a live action of Ted Kord. Here’s a fan trailer for a fake Blue Beetle movie. There’s another live action effort, too. This one suggests that Ted Kord had survived Maxwell Lord’s shooting and is now quietly working as a superhero. This one is by RumbleSpoon Productions, and really captures the feel of the character, his humor and how he operates. There’s more episodes, too. Just check out RumbleSpoon’s channel. Beyond Ted Kord’s fans, Jaime Reyes even gets some live-action treatment — and not just on that episode of “Smallville” either. Check out this “test footage” created by another Beetle fanatic. Three different Beetles? CotB will take all that we can get. And maybe with all this fan activity surrounding the character, DC Comics and Warner Brothers will try a Blue Beetle project for themselves.